Adhere the nose (red décor) to a marshmallow with a drop of royal icing or melted candy melt; let dry. Join the remaining 2 marshmallows end-to-end by inserting a pretzel stick between them. 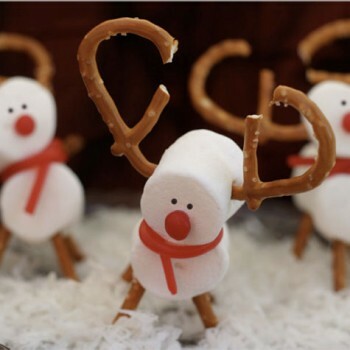 To make the antlers, break a pretzel thin in half and insert into the head (marshmallow with “nose”). Break a pretzel stick in half and secure the head, using the photo as a guide. Insert four sticks as the legs. Draw on the eyes with the Cake Mate Writer.